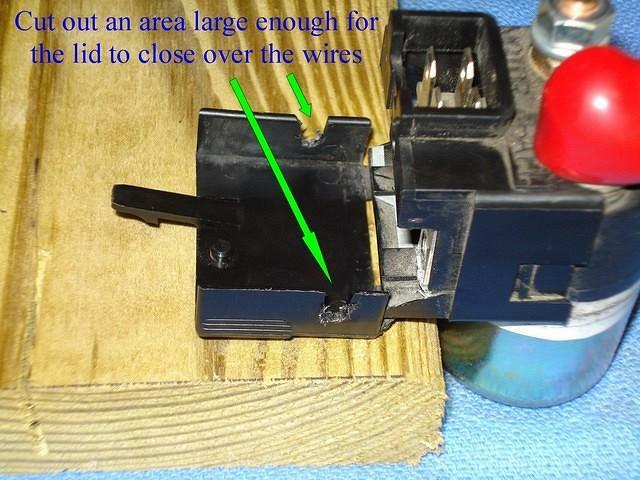 Changing 30 amp dogbone to a newer blade fuse - NGWClub®, Inc. I'm sure this has been done many times by some good members. 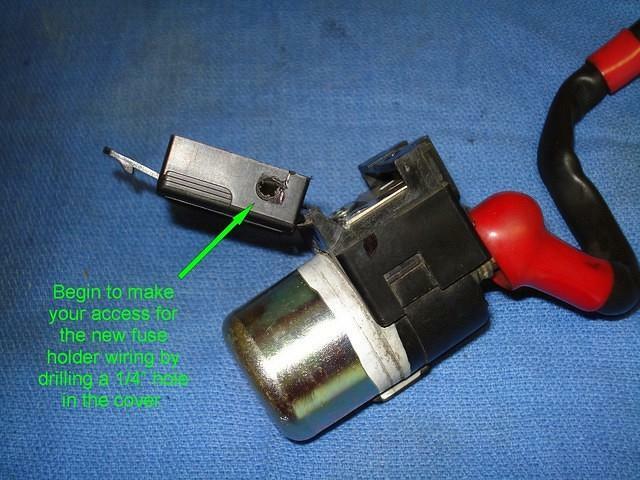 The process below is just one way to change to a newer type main 30 amp fuse. EDIT - Switching to a mini 12 volt 30 amp circuit breaker. Will fit in the same housing as the mini fuse. 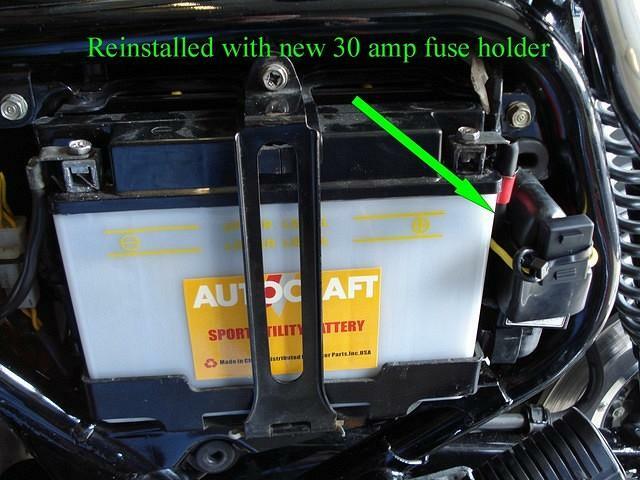 Purchased an inline mini blade fuse holder from an auto parts store, I think it was Autozone. Price was around $3.00. Removed the starter solenoid which has the dogbone fuse holder attached to it from the bike to make it easier to work on. Remove the screws and lay dogbone aside. Start to prep the fuse housing to accept the wiring for the new mini fuse holder. 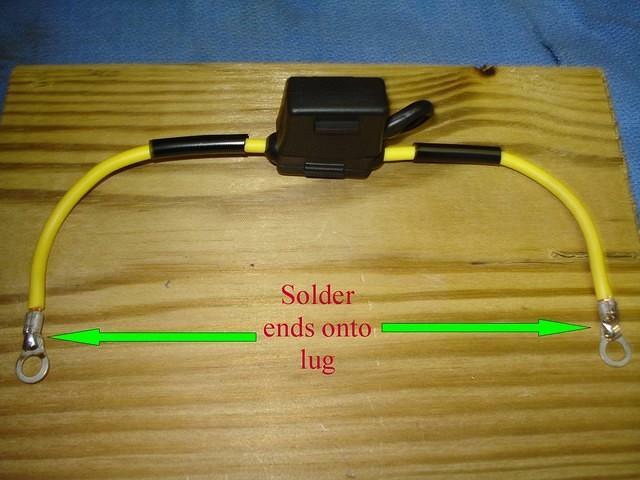 You still want the lid to close after installing the mini fuse holder wiring. Start out with a 1/4" drilled hole. I found it easier to work with the wires if I continued the holes into a slot. 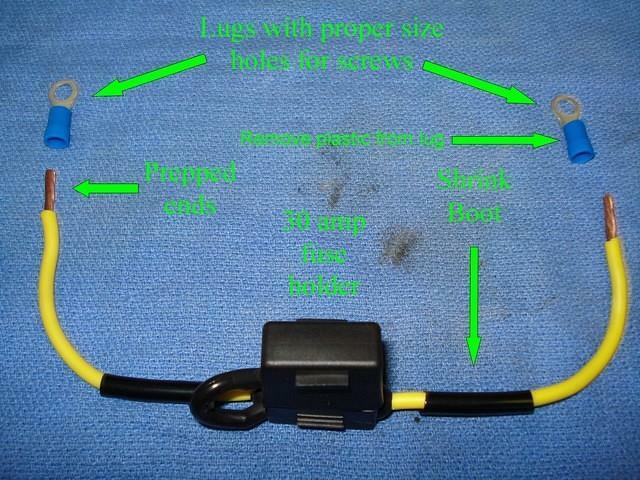 Lay out the wiring over the old dogbone location, mark and then cut your wires to length. Then prep for installation of wire ends with a hole big enough to accomidate the old dogbone screws. 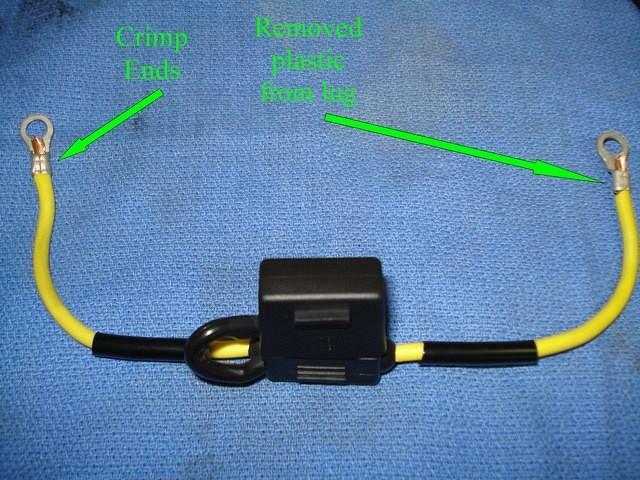 Cut the correct size shrink boot and slide onto the wires prior to attaching the wire ends. Before making the crimp on the wire ends remove the plastic sleeve (made without but these were all I had) and then prepare the wire end for soldering after the crimp is made. There are more ways to prep for soldering than I'm going to go into here. My way is to rough up the wire end where I intend to solder using a small metal file. Then I crimp the wire more for holding purposes than any other reason. One other thing I do when soldering is to use solder that does not contain any additives. I add a bit of solder flux to both ends of whatever is being joined together and have never had one come apart. 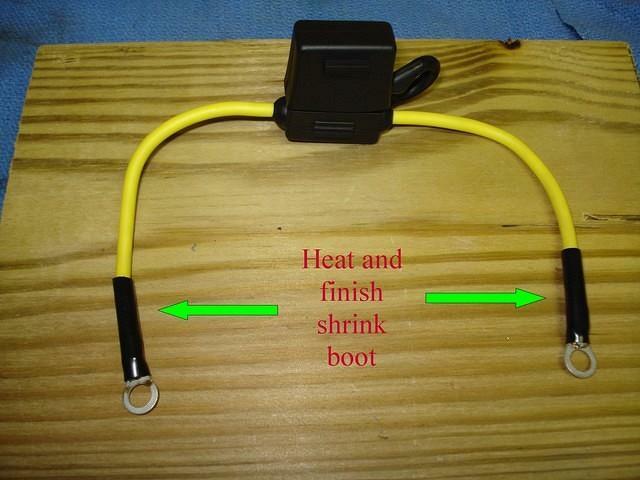 Slide up the shrink boot as far as it will go (there is some shrinkage) onto the wire end. Use a mild heat source, preferably something without a flame and shrink the material around the wire and wire end. Install the wire ends onto the location where the dogbone used to be using the screws that were holding the old dogbone, install your new mini 30 amp fuse into the proper location and close the cover and re-install onto the bike. This was all done in 09 and is still working fine. 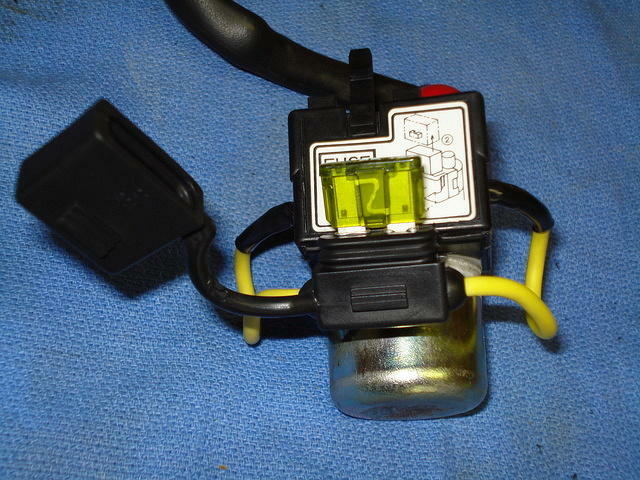 The only thing I would do differently is get one that has a spot for a spare fuse built into the housing. Being happy ain't nothing but having something to look foward too..
No matter what I'm doing I'd rather be riding. I would suggest, like any other pressure fit electrical connection, a little dielectric grease. This was installed in 2007 and fried in 2012. Roncar wrote: I would suggest, like any other pressure fit electrical connection, a little dielectric grease. This was installed in 2007 and fried in 2012. Good point CYBORG. Ordering the below 30 amp 12 volt circuit breaker as a replacement to the fuse. 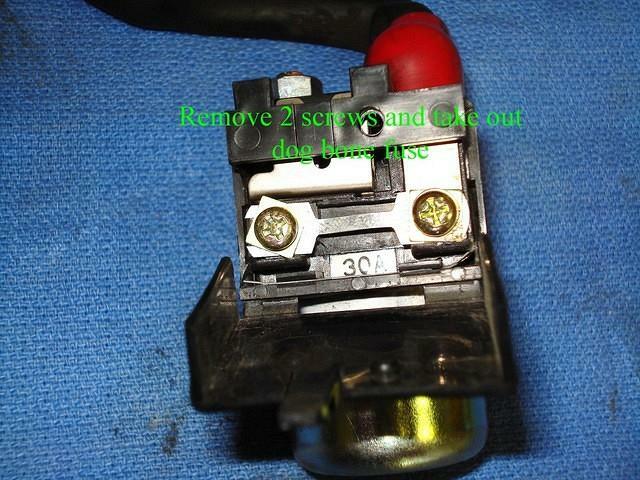 Will fit in the same space and should also eliminate the blown and damaged fuse that Roncar had. 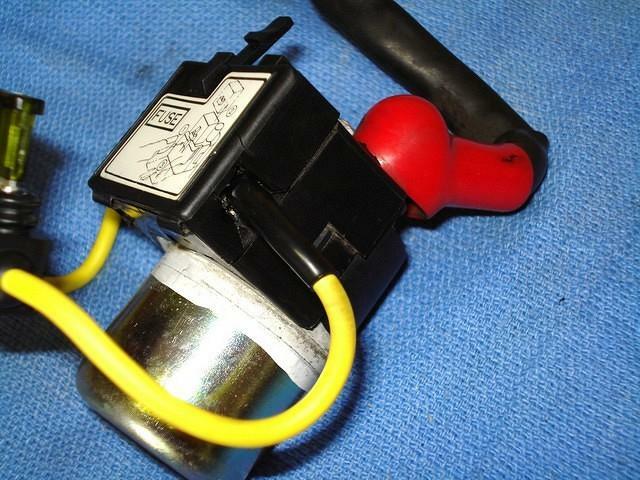 Neil wrote: should also eliminate the blown and damaged fuse that Roncar had. 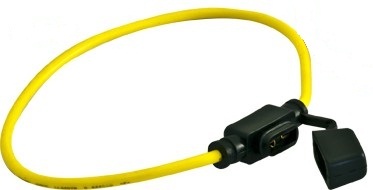 I'd still use dielectric grease on the connections. My bike had a CB when I got it and the heat from corrosion was causing the CB to trip, so I replaced it with the new fuse/holder. I suspect there is nothing wrong with the CB, I still have it in the shop....somewhere. Oh, and actually that fuse is not blown. Heated to the point of melting the connection. Looks like I have my weekend homework mapped out now. XLNT thanks for sharing this good information. The photos certainly helped me to understand. i know nothing about dielectric grease. Would that have prevented that fuse from frying and how so? Lefty wrote: XLNT thanks for sharing this good information. The photos certainly helped me to understand. i know nothing about dielectric grease. Would that have prevented that fuse from frying and how so? To my knowledge dielelectric grease is electrically insulating and helps to prevent connections from oxidizing. So, if corrosion was present when the fuse fried, it probably would have done the trick had it been applied prior to the connections cooking. Anyway, the 30 amp blade fuses are available at any auto parts store but you'd be hard pressed to find a replacement dogbone fuse quickly if you didn't have a spare along with you. Thanks Bob. I will consider buying two more spare dog bones at a buck a piece just because it is better to have a sufficiency of fuses. I do like the 30 amp or circuit breaker fix but am not wishing to drill and solder for a $1 part. I admire the inventivness and capablilities of the members on this board. Ask anything about a early Goldwing and great answers come forth.